THE PLACE TO RELAX, PLAY AND GET AWAY! This little-known family-oriented resort is surrounded by beautiful, mature woodlands and nestled in the Thickwood Hills Countryside. It is easy to forget the fast pace of the city life with a view like this at your front door! Our gorgeous lake retreat is ideally located only 1 hour from 3 major Saskatchewan cities: Saskatoon, Prince Albert and North Battleford. Find Lac La Peche by travelling 17 kms north of Blaine Lake on Highway 12 and then 5 kms west on a grid road named TWP RD 456. This 3-season resort is the ideal place to vacation any time of year, for couples, families, and friends. There are endless possibilities for adventure and relaxation here. Relax on your cabin’s private deck as you watch the beautiful sunset set over the water, roast marshmallows over your fire pit as the northern lights dance across the lake and count the infinite stars that light up the sky at picturesque Lac La Peche. Join the Beach Club! We’ll only email you about special events and dates. Fishing, hunting, snowmobiling, ice-fishing, cross-country skiing, boating, tubing, seadoo-ing, hiking, bird watching, volleyball, horse-shoes and even swimming and tanning are all official sports at Lac La Peche Resort! The spring-fed lake is a fisherman’s dream. It is stocked with walleye and also hosts an abundant northern pike population, a great place for ice fishing in the winter, or summer-time trolling in one of our motorized fishing boats available for rent. Lac La Peche Resort is popular with hunters and birdwatchers alike, as it boasts an abundance of wildlife. White tail deer, mule deer, Canada geese and many species of migrating birds make this the ideal place for nature lovers. 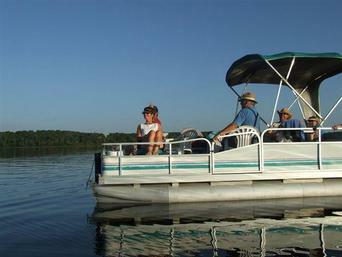 We have a paddle boat, kayaks, paddle boards, fishing boats and pontoon boats for rent. Lac La Peche Resort is home to 5 cabins that sleep 2-6 people from Spring to Fall. The cabins are furnished with fridges, stoves, microwaves, water coolers, drip coffee makers, kettles, toasters, dishes, pots and cutlery. They also each have their own barbecues, decks, picnic tables and fire pits for your private use. One of these cabins is the deluxe cabin for those with a penchant for rustic luxury. This cabin is lakefront with a deck, full kitchen, living room, fireplace and a complete bathroom with a tub and shower. This cabin also sleeps 6 and gets booked up quickly! Bring Your Camera…and your friends! Many group bookings and family reunions have enjoyed the sites and hospitality at Lac La Peche. The concession & rental cabins are all situated on the west side of the lake and have a picturesque view of the lake and rolling hills of the area. There are clean heated coin-operated showers available for all our guests' convenience. Boost your fuel efficiency! No need to weigh down that vehicle to haul a bunch of equipment here, we offer fishing boats, canoes. kayaks, paddle boards, paddleboat and pontoon boat rentals with many different packages available for every price range. Don’t worry about bringing firewood and drinking water either; we sell both at inexpensive rates for your convenience! Situated on the lake front is our concession, where you can take in the beautiful scenery on our deck as you enjoy our numerous flavours of ice cream, chips, cold drinks, and sweets. We also sell groceries and toiletry items. Candy and Brian Ashby and their friendly staff will welcome you when you arrive and do all they can to make your stay one you and yours will remember fondly for years to come. "Little piece of heaven here in Saskatchewan! Can't say enough good things about this place! If you get the chance, definitely check it out, it's worth it!" "This will be the 4th year in a row my family and I have rented cabins at Lac La Peche, Brian and Candy are so friendly! The beach is always clean, and the cabins are always immaculate. It is so peaceful and non-commercialized . Can't wait for this years trip. So excited!"